This chapter describes the available single sign-on (SSO) solutions for your WebCenter Portal application to use, and how each is configured. Section 30.1, "Introduction to Single Sign-on"
Section 30.2, "Configuring Oracle Access Manager (OAM)"
Section 30.3, "Configuring Oracle Single Sign-On (OSSO)"
Section 30.4, "Configuring SAML-based Single Sign-on"
Section 30.5, "Configuring SSO for Microsoft Clients"
Section 30.6, "Configuring SSO with Virtual Hosts"
Single sign-on can be implemented for WebCenter applications using several solutions. This section describes their benefits and recommended application. 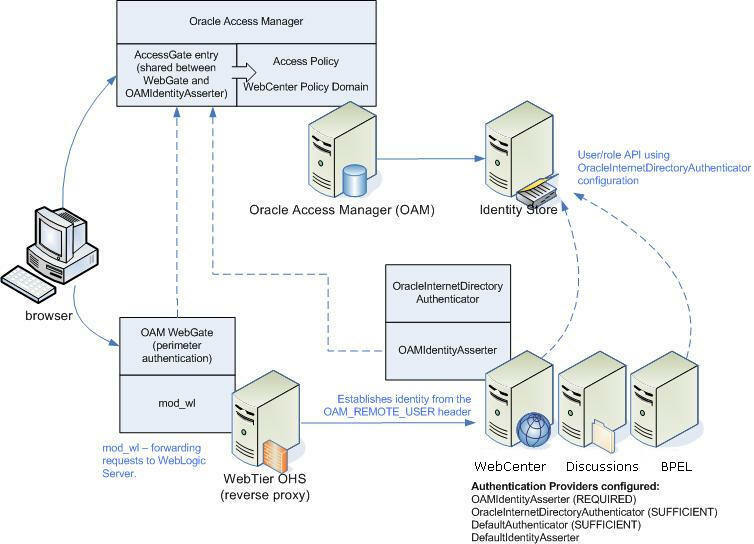 Oracle Access Manager (OAM), part of Oracle's enterprise class suite of products for identity management and security, provides a wide range of identity administration and security functions, including several single sign-on options for WebCenter Spaces and WebCenter Portal applications. OAM (in particular, OAM 11g) is the recommended single sign-on solution for Oracle WebCenter 11g installations. For deployment environments that are already invested in Oracle 10g infrastructure, and where the Oracle Application Server Single Sign-On (OSSO) server is used as the primary SSO solution, WebCenter 11g can also be configured to use OSSO for single sign-on. For non-production, development environments where you do not have an enterprise-class single sign-on infrastructure like Oracle Access Manager or Oracle SSO, and you only need to provide a single sign-on capability within WebCenter Spaces and its associated Web applications like Discussions, and Worklist, you can configure a SAML-based SSO solution. If you need to provide single sign-on for other enterprise applications as well, this solution is not recommended. If your enterprise uses Microsoft desktop logins that authenticate with a Microsoft domain controller with user accounts in Active Directory, then configuring SSO with Microsoft Clients may also be an option to consider. Oracle Access Manager (OAM) provides flexible and extensible authentication and authorization, and provides audit services. This section describes how to configure WebCenter Spaces and WebCenter Portal applications for OAM single sign-on authentication, including how to configure the WebLogic server side and the WebCenter application as the partner application participating in SSO. Section 30.2.1, "OAM Components and Topology"
Section 30.2.2, "Roadmap to Configuring OAM"
Section 30.2.3, "Installing and Configuring OAM"
Section 30.2.4, "Configuring the WebLogic Domain for OAM"
Section 30.2.5, "Installing and Configuring the Oracle HTTP Server"
Section 30.2.6, "Additional Single Sign-on Configurations"
Section 30.2.7, "Testing Your OAM Installation"
Figure 30-1 shows the components and topology required to set up single sign-on with Oracle Access Manager for a WebCenter application. Description of "Figure 30-1 OAM Single Sign-On Components and Topology"
Access Server - a standalone server that provides authentication, authorization, and auditing services for Access Gates. There is one access server set up on OAM. This is done as part of the OAM install itself. WebGate - an out-of-the-box plugin that intercepts Web resource (HTTP) requests and forwards them to the Access Server for authentication and authorization. Identity Assertion Provider (IAP) - a type of security provider that asserts the identity of the user based on header information that is set by perimeter authentication. The OAM integration provides an OAM ID Asserter that can be configured as the OAM IAP. The OAM ID Asserter can be used for authentication or for identity assertion. For OAM SSO integration, the OAM ID Asserter should be configured as an Identity Assertion Provider (IAP) by selecting obSSOCookie under Active Types in the provider's Common settings. Figure 30-2 shows the single sign-on process flow for OAM. Description of "Figure 30-2 OAM Single Sign-on Process Flow"
The user requests a resource. The WebGate forwards the request to OAM for policy evaluation. Checks for the existence of an SSO cookie. Checks policies to determine if the resource protected and if so, how? The OAM server logs and returns decisions. Unprotected resource: resource is served to the user. One per partner: OAMAuthnCookie set by 11g WebGates (ObSSOCookie set by 10g WebGate) using the authentication token received from the OAM server after successful authentication. Note: A valid cookie is required for a session. OAM logs Success or Failure. OAM Credential collector redirects to WebGate and authorization processing begins. WebGate prompts OAM to look up policies, compare them to the user's identity, and determine the user's level of authorization. OAM logs policy decision and checks the session cookie. OAM Server evaluates authorization policies and cache the result. If the authorization policy denies access, the user is redirected to another URL determined by the administrator. The flow chart (Figure 30-3) and table (Table 30-1) in this section provide an overview of the prerequisites and tasks required to configure single sign-on for WebCenter using OAM. Description of "Figure 30-3 Configuring Single Sign-on for WebCenter Using OAM"
Table 30-1 shows the tasks and sub-tasks for configuring single sign-on for WebCenter using OAM. This section describes how to install and configure either OAM 11g or OAM 10g, the recommended single sign-on solutions for WebCenter installations. Installing OAM should be performed only after you've installed Oracle WebCenter (described in the Oracle Fusion Middleware Installation Guide for Oracle WebCenter) and any other components required for your environment. You should also have configured and tested any required connections. Section 30.2.3.1, "Installing and Configuring OAM 11g"
Section 30.2.3.2, "Installing and Configuring OAM 10g"
Section 30.2.3.1.1, "Installing and Configuring OAM 11g"
Section 30.2.3.1.2, "Installing and Configuring the Oracle HTTP Server"
Section 30.2.3.1.3, "Installing the WebGate on the Web Tier"
Section 30.2.3.1.4, "Registering the WebGate Agent"
Install Oracle Access Manager (OAM) as described in "Installing the Oracle Identity Management 11g Software" in the Oracle Fusion Middleware Installation Guide for Oracle Identity Management. Ideally, OAM and all the applications that participate in single sign-on should share the same identity store. By default, OAM uses the embedded LDAP identity store. To configure OAM to use an external identity store such as OID, see Section 28.1, "Reassociating the Identity Store with an External LDAP Server." Continue by configuring Oracle Access Manager in a WebLogic administration domain as described in "Configuring Oracle Access Manager (OAM)" in the Oracle Fusion Middleware Installation Guide for Oracle Identity Management. If you don't already have Oracle HTTP Server (OHS) installed, install OHS (11.1.1.4.0) as described in Section 30.2.5, "Installing and Configuring the Oracle HTTP Server." If you do have an existing installation, you will need to apply a patch to bring it up to OHS (11.1.1.4.0) as described in "Applying the Latest Oracle Fusion Middleware Patch Set" in the Oracle Fusion Middleware Patching Guide. After installing or patching OHS, continue by installing the WebGate as described in Section 30.2.3.1.3, "Installing the WebGate on the Web Tier." This section describes how to install and configure the OHS WebGate. Ensure that your Oracle HTTP server is down while installing OHS WebGate, and restart it only after you register the WebGate agent as described in Section 30.2.3.1.4, "Registering the WebGate Agent." For Linux and Solaris operating systems, download and install the third-party GCC libraries to the same location where OHS is installed as described in "Installing Third-Party GCC Libraries (Linux and Solaris Operating Systems Only)" in the Oracle Fusion Middleware Installation Guide for Oracle Identity Management. Install the WebGate as described in the section on "Installing Oracle HTTP Server 11g WebGate for Oracle Access Manager" in the Oracle Fusion Middleware Installation Guide for Oracle Identity Management. Use the same middleware home that was specified during OHS install. Note that during the installation you will need to point to the directory containing the GCC libraries downloaded in the previous step. Note that an Instance Home for Oracle HTTP Server is created after you configure the Oracle HTTP Server. This configuration should be performed after installing or patching to Oracle HTTP Server 11.1.1.4.0. Add the <Webgate_Installation_Directory>\webgate\ohs\lib and <Oracle_Home_for_Oracle_HTTP_Server>\bin locations to the PATH environment variable. Add a semicolon (;) followed by this path at the end of the entry for the PATH environment variable. The -oh <WebGate_Oracle_Home> and -o <output_file> parameters are optional. After installing the WebGate on the Web Tier, you also need to register the WebGate agent. For more detailed information about registering the WebGate agent, see "Getting Started with a New Oracle HTTP Server 11g Webgate Agent for Oracle Access Manager" in the Oracle Fusion Middleware Installation Guide for Oracle Identity Management. Register the new Web Gate agent using the oamreg tool in inband mode. Replace the contents within $$oamhost$$:$$oamadminserverport$$ with the OAM host and administration server port, and $$webtierhost$$ with your Web Tier host and port. Copyright (c) 2009, 2010, Oracle and/or its affiliates. All rights reserved. DESCRIPTION: Modify with specific values and pass file as input to the tool. Password accepted. Proceeding to register..
INFO: Passwords matched and accepted. Inband registration process completed successfully! Output artifacts are created in the output folder. Go to Application Domain> $$webtierhost$$_webcenter > Authentication Policies and create a new policy underneath it called WebCenter REST Auth Policy. Choose Authentication scheme as BASIC Scheme. Go to Application Domain> $$webtierhost$$_webcenter > Authentication Policies > Protected Resource Policy and remove all entries starting with /rest. Return to the WebCenter REST Auth Policy created above, add all the /rest entries you removed and click Apply. REST needs to follow the BASIC authentication scheme so that external clients, such as the Outlook plugin and iPhone application, can connect to WebCenter REST and be protected with SSO. After installing and configuring the Web Tier and associated components, continue by configuring the Policy Manager as described in Section 30.2.4, "Configuring the WebLogic Domain for OAM," and performing any additional service and component configurations that apply as described in Section 30.2.6, "Additional Single Sign-on Configurations." Section 30.2.3.2.1, "Installing and Configuring OAM 10g"
Section 30.2.3.2.2, "Installing and Configuring the Oracle HTTP Server"
Section 30.2.3.2.3, "Configuring the WebCenter Policy Domain"
Section 30.2.3.2.4, "Installing the WebGate 10g on the Web Tier"
If you don't already have Oracle Access Manager (OAM) 10g installed, install OAM 10g as described in the Oracle Access Manager Installation Guide. After installing or patching OHS, continue by installing the WebGate as described in Section 30.2.3.2.3, "Configuring the WebCenter Policy Domain." These steps assume that you've installed Oracle WebCenter (see Section 2.3, "Installing WebCenter Spaces"). By default, an Oracle WebCenter installation creates a WebLogic Server domain, including an Administration Server and four managed servers: WC_Spaces, WC_Collaboration, WC_Utilities, and WC_Portlet. Determine which access server to use. Log onto the Access Manager. Open the Access System Configuration tab. Click Access Server Configuration to display a list of all access servers. Click an access server in the list to see server details. The host name and port are the values you need for the oam_aaa_host and oam_aaa_port parameters respectively in the script. The oamcfgtool.jar is available in ORACLE_HOME/modules/oracle.oamprovider_11.1.1/oamcfgtool.jar in the WebCenter installation. Values in bold are the ones that you must supply based on the settings of your WebCenter and OAM instances. We recommend that you register your domain (for <your_domain_name>) as something like "webtier.example.com", where "webtier.example.com" is your Web Tier, so that you can easily distinguish the various policies in OAM. Successfully completed the Create operation. If your command runs successfully, you should see the same output as above. If your instance also contains a SOA installation, then run oamcfgtool again to protect the SOA URIs in the policy domain you created in the previous step. Use the same parameters as the ones used in the previous step so that the existing policy domain is updated with URIs in the soa.oam.conf file. If your installation contains Oracle Content Server, then you also need to protect these URIs. Use the same parameters as the ones used in the previous steps so that the existing policy domain is updated with the URIs in the Content Server's oam.conf file. Check the Policy Domain settings. Log on to the Oracle Access Manager. You should see the domain you just created in the list of policy domains. In the URL prefixes column, you should also see the URIs that were specified as part of the webcenter.oam.conf script file. You should also see the URIs from the SOA and Content Server OAM configuration files if you have run the oamcfgtool from SOA and Content Server domains. Click the domain you just created and open the Resources tab. The URIs you specified should display. You can also open other tabs to view and verify other settings, and manually add additional resources later, if required. Check the Access Gate Configurations. Enter some search criteria and click Go. When the Access Gate for the domain you just created displays (it will have the suffix _AG), click it to see the setting details. Locate the policy domain that you created and verified in the previous steps and open the Policies tab. Description: This policy protects REST protected URIs using BASIC authentication scheme required for functioning with the WebCenter Outlook plug-in or iPhone integration. Resource: Select all resources starting with /rest except for /rest/cmis/repository. Host Identifier: Same as the one used for the resources. In the newly created policy, navigate to Authentication Rule and add a new rule using the authentication scheme OraDefaultBasicAuthNScheme. Continue with the steps for installing the WebGate as described in Section 30.2.3.2.4, "Installing the WebGate 10g on the Web Tier." This section describes how to install the WebGate. Copy the ZIP file (Oracle_Access_Manager10_1_4_3_0_linux_GCClib.zip) containing the two gcc libraries required for the installation (libgcc_s.so.1 and libstdc++.so.5) to a /tmp directory. For more information, refer to the chapter on "Installing the WebGate" in the Oracle Access Manager Installation Guide. Information for the AccessGate can be found in the Access System Console. Check to see if the content is consistent with your environment. After installing and configuring the WebGate 10g, continue by configuring the Weblogic domain as described in Section 30.2.4, "Configuring the WebLogic Domain for OAM," and performing any additional service and component configurations that apply as described in Section 30.2.6, "Additional Single Sign-on Configurations." If your environment spans multiple domains (for example, a domain for WebCenter Spaces, a separate domain for SOA, and a separate domain for Oracle Content Server), repeat the steps in this section for each domain. Section 30.2.4.1, "Configuring the Oracle Internet Directory Authenticator"
Section 30.2.4.2, "Configuring the OAM Identity Asserter"
Section 30.2.4.3, "Configuring the Default Authenticator and Provider Order"
Section 30.2.4.4, "Adding an OAM Single Sign-on Provider"
Assuming Oracle Internet Directory is backing the OAM identity store, an Oracle Internet Directory authenticator (OracleInternetDirectoryAuthenticator) should be configured for the LDAP server that is used as the identity store of OAM, and the provider should be set to SUFFICIENT. Log in to the WebLogic Server Administration Console. For information on logging in to the WebLogic Server Administration Console, see Section 1.13.2, "Oracle WebLogic Server Administration Console." From the Domain Structure pane, click Security Realms. The Summary of Security Realms pane displays (see Figure 30-4). Description of "Figure 30-4 Summary of Security Realms Pane"
Click the realm entry for which to configure the OID authenticator. The Settings pane for the realm displays (see Figure 30-5). Description of "Figure 30-5 Settings Pane"
The Provider Settings display (see Figure 30-6). Description of "Figure 30-6 Settings Pane - Providers"
Click New to create a provider. The Create a New Authentication Provider pane displays (see Figure 30-7). Description of "Figure 30-7 Create a New Authentication Provider Pane"
Enter a name for the new provider (for example, OID Authenticator), select OracleInternetDirectoryAuthenticator as its type and click OK.
On the Providers tab, click the newly added provider. The Common Settings pane for the authenticator displays (see Figure 30-8). Description of "Figure 30-8 Common Settings Pane"
Set the control flag to SUFFICIENT and click Save. Open the Provider Specific tab. The Provider Specific Settings pane for the authenticator displays (see Figure 30-9). Description of "Figure 30-9 Provider Specific Settings for OID Authenticator"
Complete the fields as shown in the table below. Leave the rest of the fields set to their default values. Checked User login IDs are usually case insensitive. This flag is required so that the subject established contains the user name as stored in the OID. An OAM identity asserter must be configured with the provider Control Flag set to REQUIRED. The Summary of Security Realms pane displays (see Figure 30-10). Description of "Figure 30-10 Summary of Security Realms Pane"
Click the realm entry for which to configure the OAM identity asserter. The Settings pane for the realm displays (see Figure 30-11). Description of "Figure 30-11 Settings Pane"
The Provider Settings display (see Figure 30-12). Description of "Figure 30-12 Settings Pane - Providers"
The Create a New Authentication Provider pane displays (see Figure 30-13). Description of "Figure 30-13 Create a New Authentication Provider Pane"
Enter a name for the new provider (for example, OAM ID Asserter), select OAMIdentityAsserter as its type and click OK. The Common Settings pane for the authenticator displays (see Figure 30-14). Description of "Figure 30-14 Common Settings Pane"
Set the control flag to REQUIRED and check that OAM_REMOTE_USER and ObSSOCookie is set for Active Types. Click Save to save you settings. Navigate to the Provider Settings pane (see Figure 30-12). Open the Default Authenticator and check that the control flag is set to SUFFICIENT. Do the same for any providers other than the two you just created. Continue by configuring WebCenter Spaces for single sign-on mode as described in Section 30.2.6.1, "Configuring WebCenter Spaces for SSO." Also be sure to perform any further service and component configurations that apply to your environment as described in Section 30.2.6, "Additional Single Sign-on Configurations." After checking that the default authenticator's control flag is set correctly, and that the order of the providers is correct, add an OAM SSO provider and restart all servers as described below. This is required for OAM 11g, but is only required for OAM 10g if the logout URI has been explicitly configured. This step is common to both OAM 10g and OAM 11g, and should be performed after installing and configuring OAM, and before configuring the WebLogic domain. This section describes how to install and configure the Oracle HTTP server (OHS). If you do not have already have an OHS install you'd like to use, install the Oracle HTTP Server (11.1.1.4.0) using the instructions in the section on "Installing Oracle Web Tier" in the Oracle Fusion Middleware Installation Guide for Oracle Web Tier. If you do have an existing installation, you will need to apply a patch to bring it up to OHS (11.1.1.4.0) as described in "Applying the Latest Oracle Fusion Middleware Patch Set" in the Oracle Fusion Middleware Patching Guide. Configure Web Tier OHS so that it forwards requests to the Oracle WebLogic Server for WebCenter using the following example in mod_wl_ohs.conf. Make sure that the WebLogic port numbers match your configuration. For more information, see "Installing and Configuring Oracle HTTP Server 11g Webgate for OAM" in the Oracle Fusion Middleware Installation Guide for Oracle Identity Management. This example assumes that WebCenter is a non-cluster based installation. For a clustered environment change the WebLogicHost and WebLogicPort to WeblogicCluster as required for your environment. See the section on "Installing and Configuring Oracle HTTP Server 11g Webgate for OAM" in the Oracle Fusion Middleware Installation Guide for Oracle Identity Management for details. # NOTE : This is a template to configure mod_weblogic. The entries in the Location list above map the incoming paths to the appropriate WebLogic Server managed servers on which the corresponding applications reside. The configurations described in the following sections may be necessary or helpful in providing additional security for your site. After completing these configurations, continue by testing your OAM installation as described in Section 30.2.7, "Testing Your OAM Installation." If your installation requires access to Pagelet Producer (formerly Ensemble), SES, or desktop integration, then refer to the relevant sections in Section 30.6, "Configuring SSO with Virtual Hosts." Section 30.2.6.1, "Configuring WebCenter Spaces for SSO"
Section 30.2.6.2, "Configuring the Discussions Server for SSO"
Section 30.2.6.3, "Configuring the Worklist Service for SSO"
Section 30.2.6.4, "Configuring OAM for RSS Feeds Using External Readers"
Section 30.2.6.5, "Configuring the WebLogic Server Administration Console and Enterprise Manager for OAM 10g"
Section 30.2.6.6, "Configuring the WebLogic Server Administration Console and Enterprise Manager for OAM 11g"
Section 30.2.6.7, "Configuring Oracle Content Server for SSO"
Section 30.2.6.8, "Restricting Access with Connection Filters"
If your installation requires the use of Pagelet Producer and desktop integration, then also follow the steps documented in the relevant portions of Section 30.6, "Configuring SSO with Virtual Hosts." Configure the WebCenter Spaces application for SSO by adding a setting to EXTRA_JAVA_PROPERTIES. true This flag tells WebCenter that SSO is being used, so no login form should be displayed on the default landing page. Instead, it displays a login link that the user can click to invoke the SSO authentication. After making this change, restart the WC_Spaces server. This section describes how to configure Oracle WebCenter Discussions Server for single sign-on. Before configuring the discussions server for SSO, ensure that it has been configured to use the same identity store LDAP as WebCenter Spaces, as described in Section 28.1, "Reassociating the Identity Store with an External LDAP Server." If you've chosen not to move the default administrator account to an external LDAP, be sure to also follow the instructions in Section 28.5.1, "Migrating the WebCenter Discussions Server to Use an External LDAP." Where host and port are the host ID and port number of the WC_Collaboration Managed Server. Open the System Properties page and edit (if it already exists) or add the owc_discussions.sso.mode property, setting it's value to true. The jiveURL property is used when constructing links to forums in emails. This section describes how to update the discussions server connection for WebCenter Spaces so that it uses the Web Tier's host and port values. Note that the steps below assume that the Discussions service has already been installed and configured in the WebCenter domain. Using Fusion Middleware Control or WLST, change the discussion server's URL host and port settings from the WC_Spaces Managed Server's settings, to the Web Tier's host and port settings. For information about how to change these settings, see Section 14.5, "Modifying Discussions Server Connection Details." When you log in to WebCenter Spaces, you automatically sign on to the discussion server as well. Assuming that you've already set up a Worklist connection, modify the URL to use the Web Tier host and port instead of the SOA server host and port. You can do this using Fusion Middleware Control or using WLST commands as described in Section 22.3, "Setting Up Worklist Connections." By default, WebCenter RSS feeds are protected by SSO. However, they will not work well with external readers if left protected (external readers will not work at all with OAM 11g protected RSS). If access using external readers is important, Oracle recommends that the WebCenter RSS resource be unprotected so that the authentication for the RSS Servlet is handled by WebLogic Server's BASIC authentication that external readers can handle. Open the OAM Admin Console. Select Access System Console > Policy Manager and open the applicable policy domain. Open the Resources tab and remove the resource /rss/rssservlet. Go to the Default Public Policy page and uncheck the "/" resource. Return to the Resources tab and remove "/". This section describes how to optionally set up OAM single sign-on for the WebLogic Server Administration Console and Enterprise Manager. Setting up OAM SSO for Enterprise Manager and the WebLogic Server Administration Console would provide single sign-on access to same set of users for whom OAM SSO access has been configured. If want the Web Tier to be accessible to external users through OAM, but want administrators to log in directly to Enterprise Manager and the WebLogic Server Administration Console, then you may not want to complete this additional configuration step. Where host is the host ID of the server hosting the Access Manager (for example, oam.example.com), and port is the HTTP port number (for example, 8888). The Policy Manager pane displays (see Figure 30-15). Description of "Figure 30-15 Policy Manager Pane"
Locate the policy domain that you created to protect WebCenter resources. Open the Resources tab and click Add. The Resource page displays (see Figure 30-16). Description of "Figure 30-16 Policy Domain Resource Page"
Select http as the Resource Type. Select the Host Identifier for the WebCenter Web Tier. Enter the URL Prefix for the WebLogic Server Administration Console (/console) or Enterprise Manager (/em). Enter a Description for the resource. Ensure that Update Cache is selected, and then click Save. In your Web Tier, modify the mod_wl_ohs.conf file (in WT_ORACLE_HOME/instances/<your_instance>/config/OHS/ohs1/) to include the WebLogic Server Administration Console and Enterprise Manager, by adding two additional Location entries using the actual host ID for the WebCenter Administration Server for WebLogicHost. Restart the Oracle HTTP Server for your changes to take effect. and be prompted with the OAM SSO login form. This section describes how to optionally set up OAM 11g single sign-on for the WebLogic Server Administration Console and Enterprise Manager. Go to Policy Configuration > Application Domains. The Policy Manager pane displays. Locate the application domain you created using the name while registering webgate agent. Expand the Resources node and click Create. Select the Host Identifier created while registering the WebGate agent. Enter the Resource URL for the WebLogic Server Administration Console (/console) or Enterprise Manager (/em). Enter a Description for the resource and click Apply. Go to Authentication Policies > Protected Resource Policy and add the newly created resource. Follow the steps below to only allow users to access WebCenter and other services through the Web Tier OHS ports so that they can be properly authenticated. In the Domain Structure pane, select the domain you want to configure (for example, webcenter). Open the Security tab and the Filter subtab. The Security Filter Settings pane displays (see Figure 30-17). Description of "Figure 30-17 Security Filter Settings Page"
Check Connection Logger Enabled to enable the logging of accepted messages. The Connection Logger logs successful connections and connection data in the server. You can use this information to debug problems relating to server connections. In the Connection Filter field, specify the connection filter class to be used in the domain. To configure the default connection filter, specify weblogic.security.net.ConnectionFilterImpl. To configure a custom connection filter, specify the class that implements the network connection filter. Note that this class must also be present in the CLASSPATH for WebLogic Server. In the Connection Filter Rules field, enter the syntax for the connection filter rules. which says: allow all traffic coming from the local host and disallow all traffic from any other IP address. You should, of course, write the network filter(s) that are relevant to your environment. For more information about writing connection filters, see "Developing Custom Connection Filters" in Oracle Fusion Middleware Programming Security for Oracle WebLogic Server. Click Save and activate the changes. Restart all the managed servers and the Administration Server. "The Server is not able to service this request: [Socket:000445]Connection rejected, filter blocked Socket, weblogic.security.net.FilterException: [Security:090220]rule 3"
After installing and configuring either OAM 10g or 11g, check that you can access all of the configured applications below (as they apply to your environment), and that the global login and logout is giving you access to all of your configured applications without prompting you to sign in again. Also test global logout where available and make sure you are logged out of all other related applications. WebCenter Spaces: Access any protected Spaces URL (a protected Group Space, for example), and make sure that you see the SSO login challenge. If you are already logged into another related application that uses the same SSO, you should automatically be shown content. REST: Access http://ohshost:ohsport/rest/api/resourceIndex. You should see the BASIC authentication challenge. If you are already logged into another related application that uses the same SSO, you should automatically be shown content. REST: Access http://ohshost:ohsport/rest/api/cmis/.... (retrieve this from resourceIndex access output in the previous step). You should not see a login challenge and should be able to see public content. When you access this after you've logged in, then you should see all content to which you have access rights. ActivityGraph Engines: Access http://host:port/activitygraph-engines. You should see an SSO login challenge. Once logged in, you should be able to see content. Oracle Content Server: Go to the profile UI and check that you can see Content Server screens embedded in iFrames without challenging you to log in. You should also be able to access Site Studio content in Content Presenter templates without logging in as you are already logged into WebCenter Spaces application. SOA: Access links in a workflow task flow and make sure that you are not challenged to log in. Discussion Forums: Access the Discussions application at http://host:port/owc_discussions and log in. Check that the login is the SSO login challenge. Similarly, the Administration login to the Discussions server at http://host:port/owc_discussions/admin should also go through the SSO login challenge. In a default installation, WebCenter uses the HTTP ports in the Managed Server created for WebCenter. To configure WebCenter with Oracle Single Sign-On, WebCenter needs Oracle HTTP Server and the associated Module mod_osso to integrate with Oracle Single Sign-On (OSSO). The BPEL Console does not support SSO integration. When WebCenter is configured for SSO, login to BPEL must still be done through the standard login page on the BPEL Console. Section 30.3.1, "Roadmap to Configuring OSSO"
Section 30.3.2, "OSSO Components and Topology"
Section 30.3.3, "Configuring the Oracle HTTP Server and Associated Modules"
Section 30.3.4, "Configuring the OSSOIdentityAsserter"
Section 30.3.5, "Registering OHS with Oracle SSO"
The flow chart (Figure 30-18) and table (Table 30-2) in this section provide an overview of the prerequisites and tasks required to configure single sign-on for WebCenter using OSSO. Description of "Figure 30-18 Configuring Single Sign-on for WebCenter Using OSSO"
Table 30-2 shows the tasks and sub-tasks for configuring single sign-on for WebCenter using OSSO. Description of "Figure 30-19 OSSO Components and Topology"
This section describes how to load and configure the Oracle HTTP Server and associated modules. Install the Oracle Web Tier software, which contains Oracle HTTP Server (OHS) and associated mods (mod_osso and mod_wl). Configure the module mod_wl in Web Tier OHS so that it forwards requests to the Oracle WebLogic Server for WebCenter, replacing the host and port values with those for you local environment. Include the OSSO Identity Assertion Provider (IAP) provider in the Oracle WebLogic domain for WebCenter. Use the WebLogic Server Administration Console to add the OSSO IAP to your domain as shown in the steps below. If your environment spans multiple domains (for example, a domain for WebCenter Spaces, separate domain for SOA, and a separate domain for Oracle Content Server), repeat the steps in this section for each domain. The Summary of Security Realms pane displays (see Figure 30-20). Description of "Figure 30-20 Summary of Security Realms Pane"
Click the realm entry to which to add the provider. The Settings pane for the realm displays (see Figure 30-21). Description of "Figure 30-21 Settings Pane"
The Provider Settings display (see Figure 30-22). Description of "Figure 30-22 Settings Pane - Providers"
The Create a New Authentication Provider pane displays (see Figure 30-23). Description of "Figure 30-23 Create a New Authentication Provider Pane"
Enter a name for the new provider, select OSSOIdentityAsserter as its type and click OK.
Set the control flag to OPTIONAL. Ensure that OracleInternetDirectoryAuthenticator (or the primary authenticator you selected when you configured the Identity Store to use an external LDAP) is set as the primary authenticator for the domain so that the user profile can be retrieved from the associated Oracle Internet Directory server. For information about configuring the Identity Store to use an external LDAP, see Chapter 28, "Configuring the Identity Store." Register the module mod_osso in the Web Tier OHS with the SSO Server as a partner application by following the steps below. Run ssoreg from the SSO server to generate an osso.conf file and FTP it in binary mode to the Web Tier host (WT_ORACLE_HOME). The following example shows how you would register a remote partner application on a SSO Server. Check that the ORACLE_HOME environment variable is set (ORACLE_HOME here is the ORACLE_HOME of the OSSO installation on the SSO server) before running ssoreg.sh. Running this command creates a webtier.example.com.osso.conf file. Copy the WT_ORACLE_HOME/instances/<your_instance>/config/OHS/ohs1/disabled/mod_osso.conf file to WT_ORACLE_HOME/instances/<your_instance>/config/OHS/ohs1/moduleconf. All files in the moduleconf directory are included in the httpd.conf file. Copy the webtier.example.com.osso.conf file generated by ssoreg in step 1 to a location accessible in the Web Tier other than the moduleconf directory (for example, WT_ORACLE_HOME). If using FTP, be sure to transfer the file using binary mode. Add rules to the mod_osso.conf file to protect the /webcenter and related application resources URLs with Oracle SSO. #Point to proper osso.conf file. # browsers use a mod_rewrite configuration such as the following. #where www.example.com is the fully qualified domain name. Be sure to change the OssoConfigFile parameter to point to the location (and filename if you've changed it) where you copied your osso.conf file in the previous step. Restart the Web Tier so that the configuration changes to mod_osso and mod_wl take effect. Section 30.3.6.1, "Configuring WebCenter Spaces for SSO"
Section 30.3.6.2, "Restricting Access Using the Web Tier OHS Ports"
Section 30.3.6.3, "Configuring the Discussions Server for SSO"
Section 30.3.6.4, "Configuring the Worklist Service for SSO"
Section 30.3.6.5, "Configuring Oracle Content Server for SSO"
Section 30.3.6.6, "Configuring OSSO for RSS Feeds Using External Readers"
Section 30.3.6.7, "Configuring SES Crawl for SSO"
Complete the configuration for Oracle Single Sign-on (OSSO) for WebCenter Spaces by adding a setting to EXTRA_JAVA_PROPERTIES and rebooting as described in Section 30.2.6.1, "Configuring WebCenter Spaces for SSO." To only allow users to access WebCenter and other services through the Web Tier OHS ports so that they can be properly authenticated, follow the steps in Section 30.2.6.8, "Restricting Access with Connection Filters." This section describes how to configure Oracle WebCenter Discussions Server for single sign-on. Before configuring the discussions server for SSO, ensure that it has been configured to use the same identity store LDAP as WebCenter Spaces, as described in Section 28.5.1, "Migrating the WebCenter Discussions Server to Use an External LDAP." Update the jiveURL property to point to the base URL of the Web Tier. For more information on how to configure the Oracle Content Server, see "Configuring Oracle UCM to Use Single Sign-On" in the Oracle Fusion Middleware System Administrator's Guide for Universal Content Management. By default, WebCenter RSS feeds are protected by SSO. However, they will not work well with external readers if left protected. If access using external readers is important, Oracle recommends that the WebCenter RSS resource be unprotected so that the authentication for the RSS Servlet is handled by WebLogic Server's BASIC authentication that external readers can handle. Remove the following entry from mod_osso.conf. If you have SES configured for your instance, you can optionally update the WebCenter Crawl and authentication end points to use the Web Tier URL. See Chapter 21, "Managing Oracle SES Search in WebCenter" for more information. Security Assertion Markup Language (SAML) enables cross-platform authentication between Web applications or Web Services running in a WebLogic Server domain and Web browsers or other HTTP clients. WebLogic Server supports single sign-on (SSO) based on SAML. When users are authenticated at one site that participates in a single sign-on (SSO) configuration, they are automatically authenticated at other sites in the SSO configuration and do not need to log in separately. Although SAML-based single sign-on provides support for logging users onto subsequent applications after initial sign-on, global logout is not supported. Consequently, users must log out of each individual application they open. Note also that if you set up SAML-based single sign-on with WebCenter Spaces as the source application and Oracle WebCenter Discussions as the destination application, you can access administration pages of the Discussions application from the WebCenter Spaces Manage Group Space Services screen or Configure WebCenter Services screen. However, since the Oracle WebCenter Discussion administration pages do not participate in SSO, if you access administration pages directly, you are required to log in to Oracle WebCenter Discussions again. Finally, SAML-based single sign-on is not available for the sdpmessaging userprefs-ui application. As an application administrator, if you click Manage Configuration in the Preferences > Messaging dialog in WebCenter Spaces, you will need to log in again. This SSO mechanism can be used for departmental WebCenter installations for which there is no existing Oracle SSO or Oracle Access Manager single sign-on infrastructure, but single sign-on between only WebCenter Spaces and its services is required. For High Availability and large enterprise deployments, the Oracle Access Manager SSO configuration is recommended. This section describes how to set up SAML 1.1-based single sign-on for Oracle WebCenter Spaces and the Worklist service running on different managed servers within the same domain. Section 30.4.1, "SAML Components and Topology"
Section 30.4.2, "Configuring SAML-based Single Sign-on"
Figure 30-25 shows the components and their interaction in a SAML-based single sign-on configuration that includes WebCenter Spaces and the Discussions service. SAML Credential Mapper - The SAML Credential Mapping provider acts as a producer of SAML security assertions, allowing WebLogic Server to act as a source site for using SAML for single sign-on. The SAML Credential Mapping provider generates valid SAML 1.1 assertions for authenticated subjects based on the configuration of the target site or resource. Inter Site Transfer Service (ITS) - an addressable component that generates identity assertions and transfers the user to the destination site. Assertion Retrieval Service (ARS) - an addressable component that returns the SAML assertion that corresponds to the artifact. The assertion ID must have been allocated at the time assertion was generated. SAML Identity Asserter - The SAML Identity Assertion provider acts as a consumer of SAML security assertions, allowing WebLogic Server to act as a destination site for using SAML for single sign-on. The SAML Identity Assertion provider processes valid SAML 1.1 assertions for authenticated subjects obtained from the source site or resource. SAML Relying party - A SAML Relying Party is an entity that relies on the information in a SAML assertion produced by the SAML source site. You can configure how WebLogic Server produces SAML assertions separately for each Relying Party or use the defaults established by the Federation Services source site configuration for producing assertion. SAML Asserting party - A SAML Asserting Party is a trusted SAML Authority (an entity that can authoritatively assert security information in the form of SAML Assertions). Figure 30-24 shows the components and flow for a POST-configured SAML SSO configuration that includes both a WebCenter and SOA domain. The flow is similar for other destination applications participating in single sign-on such as Worklist applications and Discussions. Description of "Figure 30-24 Detailed SAML Single Sign-on Components and Topology (POST Profile Configured)"
Figure 30-25 shows a simplified version of the components and flow for a POST-configured SAML SSO configuration, including the SAML SSO flow between WebCenter Spaces and the Discussions application. Description of "Figure 30-25 SAML Single Sign-on Components and Topology (POST Profile Configured)"
The user's browser accesses WebCenter Spaces (source site), hosted on a WebLogic managed server (WC_Spaces) in the WebCenter domain (wc_domain), by supplying user credentials. WebCenter Spaces passes the user credentials to the authentication service provider. If authentication is successful, the authenticated session is established, and the WebCenter Spaces welcome page is displayed. From the welcome page, the user then clicks on a link on the page to access a secured Web page of the Discussions service (destination site), hosted on a different WebLogic Server (WC_Collaboration) in the same domain. This triggers a call to the Inter-Site Transfer Service (ITS) servlet configured. In this case, the ITS servlet is hosted within the source site (that is, on the WebCenter Spaces application on the WC_Spaces Managed Server) that shares the same JSESSIONID cookie as WebCenter Spaces. The ITS servlet calls the SAML Credential Mapper configured in the WebCenter domain (wc_domain) to request a caller assertion. The SAML Credential Mapper returns the assertion. It also returns the URL of the destination site application Web page (a secured Web page of the Discussions service) and path to the appropriate POST form (if the source site is configured to use the POST profile). The SAML ITS servlet generates a SAML response containing the generated assertion, signs it, base-64 encodes it, embeds it in the HTML form, and returns the form to the user's browser. The user's browser POSTs the form to the destination site's Assertion Consumer Service (ACS). In this case, the ACS Servlet is hosted in destination site (the Discussions service) and shares its login cookie. If the assertion is successful, the user is redirected to the target (the secured Web page of the Discussions service). The user is logged in on the destination site Discussions service without having to reauthenticate. This section describes how to configure WebCenter Spaces and services for SAML-based single sign-on using a set of automated scripts. Section 30.4.2.1, "SAML Single Sign-on Prerequisites"
Section 30.4.2.2, "Configuring SAML-based SSO"
Section 30.4.2.3, "Configuring SAML SSO for RSS Using External Readers"
Section 30.4.2.4, "Checking Your Configuration"
This section describes a set of steps that should be carrie out prior to configuring SAML-based single sign-on. Note that these steps assume that WebCenter Spaces and associated components are already installed and the relevant connections have been configured and tested. Section 30.4.2.1.1, "Configuring Oracle Content Server for SAML SSO"
Section 30.4.2.1.2, "Configuring the Discussions Server for SAML SSO"
Section 30.4.2.1.3, "Configuring and Exporting the Certificates"
Section 30.4.2.1.4, "Setting Up SSL"
If your instance uses a Documents connection that requires the use of OHS to surface the Oracle Content Server user interface in WebCenter, you need to configure WebCenter and related applications with a Web Tier. See Section 30.2.5, "Installing and Configuring the Oracle HTTP Server" for more information about installing OHS and editing mod_wl_ohs.conf. After checking that the comment text is added verbatim in the metaContainer facet of af:document, check the generated HTML page using View Source and confirm that <!--IdcClientLoginForm=1--> is in the <head> section of the HTML page. By default, the .EAR file that is deployed for the Oracle WebCenter Discussions Server supports form-based Oracle SSO or Oracle Access Manager SSO. Therefore, before you can configure the Oracle WebCenter Discussions Server for SAML-based single sign-on, you must also first deploy the SAML SSO version of the discussion server .EAR file. Before configuring the discussions server for SSO, ensure that it is configured to use the same identity store LDAP as WebCenter Spaces, as described in Section 28.1, "Reassociating the Identity Store with an External LDAP Server." If you've chosen not to move the default administrator account to an external LDAP, be sure to also follow the instructions in Section 28.5.1, "Migrating the WebCenter Discussions Server to Use an External LDAP." Log in to the WebLogic Server Administration Console as an administrator. In the Domain Structure pane, click Deployments. The Deployments Summary pane displays (see Figure 30-26). Description of "Figure 30-26 Deployment Summary Pane"
On the Deployment Summary page, select owc_discussions stop and delete and click Install. Using the Install Application Assistant Path field, locate the SSO enabled owc_discussions .EAR file (owc_discussions_samlsso.ear, typically in $WC_ORACLE_HOME/discussionserver). Select the owc_discussions_samlsso.ear file and click Next. Select Install this deployment as an application and click Next. Set the Name to owc_discussions. Log in to the Discussions Server Administration Console as an administrator (see Section 30.2.6.2, "Configuring the Discussions Server for SSO" for more information on logging in to the Discussions Server Administration Console). Open the System Properties page and edit (if it already exists) or add the owc_discussions.sso.mode property, setting its value to true. Restart the WC_Collaboration Managed Server (where the discussions server is deployed). To secure communication between the SAML source and destination sites, communication should be encrypted. Additionally, certificates should be used to verify the identity of the other party during SAML interaction. Follow the steps below to generate a key using the keytool utility (available as part of the JDK 6.0), and register it using the WebLogic Server Administration Console. Configure the necessary keystore for the WC_Spaces and Administration servers in the WebCenter domain. This keystore should contain the certificate you intend to use for securing the SAML assertions. If you only want to test the configuration, you can either create a "demoidentity" certificate that is packaged in the DemoIdentity keystore that is configured by default, or you can use keytool to generate a new certificate in the DemoIdentity keystore. For more information about configuring a custom identity keystore, see Section 31.1.2, "Configuring the Custom Identity and Java Trust Keystores." Using keytool, export the certificate you have chosen to use to encrypt SAML assertions. Be sure to run the export command on the keystore that is configured for WC_Spaces and the Administration server for the WebCenter Spaces domain. Note that the keytool -export command should be run from the WebCenter Spaces machine and should export the certificate being used in the SAML SSO setup residing in the keystore configured for the WebCenter Spaces server. Copy or transfer the file into the destination domains (such as SOA, Oracle Content Server, and Collaboration) and configure the certPath value in the wcsamlsso.properties file when you are ready to run the SAML SSO script as described in Section 30.4.2.2.1, "The Single Sign-on Script." If the WebCenter installation requires SSL for providing transport-level security, then SSL should be configured before configuring single sign-on as described in Chapter 31, "Configuring SSL." Note that setting up SSL is not related to enabling SSO. After installing WebCenter Spaces and services as required for your environment, continue by configuring SAML-based single sign-on using the scripts as described in this section. Section 30.4.2.2.1, "The Single Sign-on Script"
Section 30.4.2.2.2, "Using the Scripts"
This section captures the login information, WebLogic Admin URL, WebCenter Spaces server and URL, and so forth, of the WebCenter domain required for the Credential Mapper and Source Site Federation Services configuration. All properties in this section must be completed. url - WebCenter URL. If usesSSL is "true", then change "http" to "https". If WebCenter Spaces is front-ended with Web Tier, then specify the Web Tier host and port here. This section captures the login information, admin URL, certificate file path, and so forth, of the Collaboration domain required for the Identity Asserter and Destination Site Federation Services configuration. Only complete this section if your setup has Discussions configured. This section captures the login information, admin URL, and certificate file path of the Utilities domain required for the Identity Asserter and Destination Site Federation Services configuration. Complete this section out only if your setup is configured with the Activity Graph application. This section captures the login information, admin URL, certificate file path, and so forth, of the SOA domain required for the Identity Asserter and Destination Site Federation Services configuration. Only complete this section if your setup has SOA configured. This section captures the login information, admin URL, certificate file path, and so forth, of the Oracle Content Server domain required for the Identity Asserter and Destination Site Federation Services configuration. Only complete this section if your installation has the Documents service configured. url - RSS URL. If usesSSL in spaces_config is "true", then change "http" to "https". If RSS is front-ended with Web Tier, then specify the Web Tier host and port here. url - REST URL. If usesSSL in spaces_config is "true", then change "http" to "https". If REST is front-ended with Web Tier, then specify the Web Tier host and port here. Complete this section if your configuration has Discussions installed. url - OWC Discussions URL. If usesSSL in collab_config is "true", then change "http" to "https". IF Discussions is front-ended with Web Tier, then specify the Web Tier host and port here. Complete this section of SOA is installed and Worklist is configured for WebCenter Spaces. worklist_detail - Worklist Detail application URL. If usesSSL in soa_config is "true", then change "http" to "https". If Worklist Detail application is front-ended with Web Tier, then specify the Web Tier host and port here. worklist_sdp - Worklist SDP application URL. If usesSSL in soa_config is "true", then change "http" to "https". If Worklist Detail application is front-ended with Web Tier, then specify the Web Tier host and port here. worklist_integration - Worklist Integration application URL. If usesSSL in soa_config is "true", then change "http" to "https". If Worklist Detail application is front-ended with Web Tier, then specify the Web Tier host and port here. Complete this section if your configuration has the Utilities server installed. url - ActivityGraphEngines URL. If usesSSL in spaces_config is "true", then change "http" to "https". If the Activity Graph application is front-ended with Web Tier, then specify the Web Tier host and port here. Complete this section if your configuration has Oracle Content Server installed and you have a Documents service connection configured for the WebCenter Spaces application. url - Content Server URL. If usesSSL in spaces_config is "true", then change "http" to "https". If Oracle Content Server is front-ended with Web Tier, then specify the Web Tier host and port here. Note that if both WebCenter Spaces and Oracle Content Server are configured for your environment, then they must both be accessed using the same Web Tier. Executable script ($WC_ORACLE_HOME/webcenter/scripts/samlsso/configureCS.py) to configure asserting and relying parties for the Oracle Content Server application. Ensure that the Administration server for all the domains used in this configuration are up and running. Generate the config and key files containing the connection information for the various domains using the storeUserConfig WLST command from the $WC_ORACLE_HOME/common/bin so that the properties file is picked up. Use the command-line help (help('storeUserConfig')) for usage and syntax details. This creates a user configuration file and an associated key file. The user configuration file contains an encrypted username and password. The key file contains a secret key that is used to encrypt and decrypt the username and password. The above command stores the config and key files in the directory from where WLST was invoked, or you can optionally specify a more secure path. Repeat step 2a after connecting to the Oracle Content Server domain using the admin username and password. Launch WLST and run the WLST encrypt command to encrypt the certificate password. Use the command-line help (help('encrypt')) for usage and syntax details. This displays the encrypted certificate password. The encrypt command uses the encryption for a specified WebLogic Server domain root directory. The encrypted output needs to be set as the certPassword value in wcsamlsso.properties mentioned in the next step. Since this password will be set onto the credential mapper and source site federation services in the WebCenter domain, ensure that you run the encryption utility from the WebCenter domain. Edit $WC_ORACLE_HOME/common/bin/wcsamlsso.properties and complete the sections applicable to your setup. Refer to Section 30.4.2.2.1, "The Single Sign-on Script" for a detailed description of the sections in the properties file. Launch WLST from $WC_ORACLE_HOME/common/bin and execute the scripts in the order shown below. Run the scripts in the WLST offline mode as the scripts include an explicit connect command. Restart all servers including the Administration server in the WebCenter domain. If Discussions belongs to the same domain as WebCenter Spaces, then only restart the WC_Collaboration Managed Server. Otherwise, restart all servers including the Administration server in the Collaboration domain. If the Utilities server belongs to the same domain as WebCenter Spaces, then only restart the WC_Utilities server. Otherwise, restart all servers including the Administration server in the Utilities domain. Restart all servers including the Administration server in the SOA domain. Restart all servers including the Administration server in the Oracle Content Server domain. Run the individual commands below as required for your environment. execfile('<wc_oracle_home>/webcenter/scripts/samlsso/configureREST.py') - No restart is required. execfile('<wc_oracle_home>/webcenter/scripts/samlsso/configureRSS.py') - No restart is required. execfile('<wc_oracle_home>/webcenter/scripts/samlsso/configureForum.py') - Do this if you have Discussions installed in your setup. No restart is required. execfile('<wc_oracle_home>/webcenter/scripts/samlsso/configureActivityGraphEngine.py') - Do this if you have Utilities installed in your setup. No restart is required. execfile('<wc_oracle_home>/webcenter/scripts/samlsso/configureWorklistIntegration.py') - Do this if you have Worklist installed in your setup. No restart is required. execfile('wc_oracle_home>/webcenter/scripts/samlsso/configureWorklistDetail.py') - Do this if you have Worklist installed in your setup. No restart is required. execfile('<wc_oracle_home>/webcenter/scripts/samlsso/configureWorklistSDP.py') - Do this if you have Worklist installed in your setup. No restart is required. execfile('<wc_oracle_home>/webcenter/scripts/samlsso/configureCS.py') - Do this if you have Oracle Content Server installed in your setup. No restart is required. Check your installation using the steps provided in Section 30.4.2.4, "Checking Your Configuration." Since the properties file contains sensitive information, delete it from $WC_ORACLE_HOME/common/bin after you have configured and verified the SAML SSO setup. Also delete the config and key files you generated in step 2 above. If you encounter errors when running the scripts, you must remove the asserting and relying parties set up by the scripts before running the scripts again. Go to the Relying Parties Management Settings Pane and delete the appropriate relying parties. Go to the Asserting Parties Settings Pane and delete the appropriate asserting parties. Continue by fixing the issue reported and re-running the scripts. Log onto the WLS Administration Console for the WebCenter Spaces domain. Open the security realm and select Providers >Credential Mapping > wcsamlcm> Management > Relying Parties. Disable or delete the relying party for RSS. Open the security realm and select Providers > Authentication > wcsamlia > Management > Asserting Parties. Disable or delete the asserting party for RSS. Using a new browser, log in to WebCenter Spaces and check that you're not challenged for credentials when you click Forum Administration from Group Space Settings > Services > Discussions (assuming this service is provisioned for the group space). Access the RSS link from Discussions or WorkList task flow, and check that you are not challenged to log in. For Oracle Content Server, go to the Profile user interface and make sure you see Content Server screens embedded in iFrames without being challenged to log in. You should also be able to access Site Studio content in Content Presenter templates without being challenged to log in as you are already logged into WebCenter Spaces. Access http://host:port/rest/api/resourceIndex and make sure you see the BASIC authentication challenge. If you are already logged in to another related application that uses the same SSO, you should shown content without being challenged to log in. To test SOA, access links in the Workflow task flow and make sure you are not challenged to log in. If while testing SAML SSO you encounter 404 or 403 errors, check the SAML configuration and also turn on debug logging for SAML on the AdminServer. Also turn on logging for the WC_Spaces server and the server hosting your destination site. The logs will be available in $domain.home/servers/<server>/logs/<server>.log. For information on how to turn on logging for WC_Spaces and other application servers, see Section 36.3, "Viewing and Configuring Log Information." This section describes how to set up single sign-on (SSO) for Microsoft clients, using Windows authentication based on the Simple and Protected Negotiate (SPNEGO) mechanism and the Kerberos protocol, together with the WebLogic Negotiate Identity Assertion provider for the WebCenter Spaces application. This SSO approach enables Microsoft clients (such as browsers), authenticated in a Windows domain using Kerberos, to be transparently authenticated to web applications (such as WebCenter Spaces) in a WebLogic domain based on the same credentials, and without the need to type in their password again. Cross-platform authentication is achieved by emulating the negotiate behavior of native Windows-to-Windows authentication services that use the Kerberos protocol. In order for cross-platform authentication to work, non-Windows servers (in this case, WebLogic Server) must parse SPNEGO tokens in order to extract Kerberos tokens, which are then used for authentication. Section 30.5.1, "Microsoft Client SSO Concepts"
Section 30.5.3, "Configuring Microsoft Clients"
Kerberos is a secure method for authenticating a request for a service in a network. The Kerberos protocol comprises three parties: a client, a server and a trusted third party to mediate between them, known as the KDC (Key Distribution Center). Under Kerberos, a server allows a user to access its service if the user can provide the server a Kerberos ticket that proves its identity. Both the user and the service are required to have keys registered with the KDC. The diagram below describes the basic exchanges that must take place before a client connects to a server. Description of "Figure 30-27 Connecting to a Server Through a Key Distribution Center"
SPNEGO (Simple and Protected GSSAPI Negotiation Mechanism) is a GSSAPI "pseudo mechanism" that is used to negotiate one of several possible real mechanisms. SPNEGO is used when a client application wants to authenticate to a remote server, but neither end is sure what authentication protocols the other supports. The pseudo-mechanism uses a protocol to determine what common GSSAPI mechanisms are available, selects one, and then dispatches all further security operations to it. This can help organizations deploy new security mechanisms in a phased manner. SPNEGO's most visible use is in Microsoft's HTTP Negotiate authentication extension. The negotiable sub-mechanisms include NTLM and Kerberos, both used in Active Directory. Description of "Figure 30-28 SPNEGO-based Authentication"
A properly configured Internet Explorer browser. Internet Explorer 6.01 or later is supported. .NET Framework 1.1 and a properly configured Web Service client. Clients must be logged on to a Windows 2000 domain and have Kerberos credentials acquired from the Active Directory server in the domain. Local logons will not work. Configuring SSO with Microsoft clients requires configuring the Microsoft Active Directory, the Microsoft client, and the WebLogic Server domain shown in Figure 30-29. For detailed configuration steps and troubleshooting, see "Configuring Single Sign-On with Microsoft Clients" in Oracle Fusion Middleware Securing Oracle WebLogic Server. Description of "Figure 30-29 Configuring SSO with Microsoft Clients"
Configure your network domain to use Kerberos. Create a Kerberos identification for WebLogic Server. Create a user account in the Active Directory for the host on which WebLogic Server is running. Create a Service Principal Name for this account. Create a user mapping and keytab file for this account (see "Configuring Single Sign-On with Microsoft Clients" in Oracle Fusion Middleware Securing Oracle WebLogic Server). Choose a Microsoft client (in this case Internet Explorer) and configure it to use Windows Integrated authentication. Set up the WebLogic Server domain (wc_domain in this case) to use Kerberos authentication. Create a JAAS login file that points to the Active Directory server in the Microsoft domain and the keytab file created in Step 2 (see "Creating a JAAS Login File" in Oracle Fusion Middleware Securing Oracle WebLogic Server). Configure a Negotiate Identity Assertion provider in the WebLogic Server security realm (see Section 30.5.3.1, "Configuring the Negotiate Identity Assertion Provider"). Configure the WebLogic Server domain to use the Active Directory Authenticator so that the WebLogic domain uses the same Active Directory of the domain as the identity store. You could also use a different identity store and match the users in this store with the Active Directory users of your domain, but using the Active Directory authenticator is recommended as maintaining two different identity stores risks them getting out of sync (see Section 30.5.3.2, "Configuring an Active Directory Authentication Provider"). Ensure that only the identity store is configured for Active Directory. The policy and credential stores are not certified for Active Directory. The non_sso values are the value on the machine for protocol, host, and port. The sso values are the value that the user would see when directed through OHS. Start the WebLogic Servers (Administration Server and managed servers) using specific start-up arguments. Repeat steps 4, 5, and 6 for the SOA domain to enable single sign-on for SOA applications. Configure WebCenter Spaces (see Section 30.5.3.3, "Configuring WebCenter Spaces"). Configure the discussions server (see Section 30.5.3.4, "Configuring the Discussions Server for SSO"). This section provides instructions for creating and configuring a Negotiate Identity Assertion provider. The Negotiate Identity Assertion provider enables single sign-on (SSO) with Microsoft clients. The identity assertion provider decodes Simple and Protected Negotiate (SPNEGO) tokens to obtain Kerberos tokens, validates the Kerberos tokens, and maps them to WebLogic users. The Negotiate Identity Assertion provider uses the Java Generic Security Service (GSS) Application Programming Interface (API) to accept the GSS security context through Kerberos. The Summary of Security Realms pane displays (see Figure 30-30). Description of "Figure 30-30 Summary of Security Realms Pane"
The Settings page for the security realm displays (see Figure 30-31). Description of "Figure 30-31 Security Realm Settings Page"
Open the Providers tab and select the Authentication subtab. The Authentication Settings pane displays (see Figure 30-32). Description of "Figure 30-32 Authentication Settings Pane"
The Create a New Authentication Provider pane displays (see Figure 30-33). Description of "Figure 30-33 Create a New Authentication Provider Pane"
Enter a Name for the identity asserter, and select NegotiateIdentityAsserter as the Type. Follow the steps below to configure an Active Directory authentication provider using the WebLogic Administration Console. The Summary of Security Realms pane displays (see Figure 30-34). Description of "Figure 30-34 Summary of Security Realms Pane"
The Settings page for the security realm displays (see Figure 30-35). Description of "Figure 30-35 Security Realm Settings Page"
The Authentication Settings pane displays (see Figure 30-36). Description of "Figure 30-36 Authentication Settings Pane"
The Create a New Authentication Provider pane displays (see Figure 30-37). Description of "Figure 30-37 Create a New Authentication Provider Pane"
Enter a Name for the authentication provider, and select ActiveDirectoryAuthenticator as the Type. Click the authentication provider you just created in the list of providers. The Settings page for the provider displays (see Figure 30-38). Description of "Figure 30-38 Provider Settings Page"
Open the Configuration tab and the Common subtab. The Control Flag settings of any other authenticators must also be changed to SUFFICIENT. If there is a pre-existing Default Authenticator that has its Control Flag set to REQUIRED, it must be changed to SUFFICIENT. Open the Provider Specific subtab. The Provider Specific Settings pane displays (see Figure 30-39). Description of "Figure 30-39 Provider Specific Settings Pane"
Turn off public access, by logging in to WebCenter Spaces as an administrator and removing View access from the Public-User role. When public access is turned off, accessing the URL http://host:port/webcenter takes the user directly to the authenticated view rather than the default public page which has a login section. This is recommended when users are accessing WebCenter Spaces only using Internet Explorer, and are confined to the domain where WNA is set up. If you must retain public access to WebCenter Spaces, then the recommendation is to use the oracle.webcenter.spaces.osso=true flag when starting the WC_Spaces server. This flag tells WebCenter Spaces that SSO is being used and no login form should be displayed on the default landing page. A Login link is displayed instead that the user can click to invoke the SSO authentication where the user will be automatically logged in. If Firefox is used to access WebCenter Spaces within the Windows network configured for WNA, or any browser is used to access WebCenter Spaces from outside the Windows network domain, users see the login page after clicking the Login link. This section describes the OHS configuration required for an environment containing applications that use "/" as the context root, and the additional configuration required in OHS when single sign-on is involved. Section 30.6.1, "Understanding the Need for a Virtual Host"
Section 30.6.2, "Configuring Virtual Hosts for OSSO"
Section 30.6.3, "Configuring Virtual Hosts for OAM 10g"
Section 30.6.4, "Configuring Virtual Hosts for OAM 11g"
Section 30.6.5, "Configuring WebCenter for Virtual Hosts"
Section 30.6.6, "Testing Your Configuration"
However, this would affect all context roots not explicitly defined. Also, we have two applications requiring "/" mapping, which is not possible for a single OHS instance and brings up the need for virtual host configuration. The term virtual host refers to the practice of running more than one web site (such as www.company1.com and www.company2.com) on a single machine. Virtual hosts can be IP-based, meaning that you have a different IP address for each web site, or name-based, meaning that you have multiple names running on each IP address. The fact that they are running on the same physical server is not apparent to the end user. For more information about virtual hosts, refer to your Apache documentation. This section describes the steps for configuring virtual hosts when OSSO is configured as the single sign-on solution. Prior to completing these steps you should already have completed the steps in Section 30.3, "Configuring Oracle Single Sign-On (OSSO)." For more information about using virtual hosts with OSSO, see "Configuring mod_osso with Virtual Hosts (SSL and non-SSL)" in the Oracle Fusion Middleware Administrator's Guide for Oracle Single Sign-On. Copy the generated pageletproducer.osso.conf file to the Web Tier machine in the same directory as webtier.osso.conf. Move the mod_osso.conf from moduleconf to one location higher (i.e., in the same location as httpd.conf). The idea is to provide a single sign-on experience for the default virtual host (webtier.example.com) and the Pagelet Producer virtual host (pageletproducer.example.com), but not for the WebCenter Spaces virtual host (webtier-spaces.example.com) as some applications like external RSS readers and SES do not support it. Restart OHS. Also remember to update the DNS with entries for pageletproducer.example.com and webtier-spaces.example.com. In the webtier-spaces.example.com virtual host that bypasses single sign-on, only some applications such as RSS and SES need to bypass single sign-on. For other applications like WebCenter Spaces, however, we need single sign-on so we deny access to these applications from this virtual host. To configure OAM 11g for virtual hosts we need to bypass single sign-on for the SES crawler and authentication end points, and RSS as their use by SES and external RSS readers only support BASIC authorization. These integrations also do not require single sign-on. For more information, see "Associating a WebGate with Particular Virtual Hosts, Directories, or Files" in the Oracle Fusion Middleware Administrator's Guide for Oracle Access Manager for 10g. Prior to completing these steps you should already have completed the steps for configuring OAM 10g in Section 30.2, "Configuring Oracle Access Manager (OAM)." This entry causes the WebGate to intercept all requests and process them. Restart OHS. Also be sure to update the DNS with entries for pageletproducer.example.com and webtier-spaces.example.com. To configure OAM 11g for virtual hosts we need to bypass single sign-on for the SES crawler and authentication end points, and RSS as their use by SES and external RSS readers only support BASIC authorization. These integrations also do not require single sign-on. Prior to completing these steps you should already have completed the steps for configuring OAM 11g in Section 30.2, "Configuring Oracle Access Manager (OAM)." Follow the steps below to configure virtual hosts for OAM 11g. This entry causes the WebGate to intercept all requests and process it. This section describes the additional configurations required for applications routed through the virtual host. All access to Pagelet Producer applications should be done through pageletproducer.example.com. For example, when you register an Pagelet Producer producer in WebCenter Spaces or WebCenter Portal application, it should use the virtual host for Pagelet Producer. Similarly access to the Pagelet Producer administration application and access to any Pagelet Producer resources should also be done through the virtual host. Refer to the Pagelet Producer documentation for more information. Configuration changes are only required if you are using OAM 10g or 11g. Since SES is not equipped to handle OAM protected crawl sources, when you create an SES source for WebCenter crawling, specify the crawl and end point URLs using the webtier-spaces.example.com virtual host. Specify the authentication mechanism as BASIC and the realm as jazn.com as webtier-spaces.example.com bypasses single sign-on. Note that these configurations do not apply if you are using OSSO for single sign-on since if you have not configured the SES URIs in mod_osso.conf, then the authentication will be handled by WLS using BASIC authentication. For OAM, however, the WebGate tends to deny access to resources not protected by OAM and consequently the need to bypass OAM by using the virtual host. This section describes how you can test your virtual host and single sign-on configuration. Access http://webtier.example.com:7777/webcenter and check that you are challenged by SSO. Access http://pageletproducer.example.com:7777/pageletadmin. If you logged in in step 2, you should not be challenged to sign in. If you sign in from a new browser instance, however you should still be challenged by SSO. Create a protected resource (for example, google) and access it using http://pageletproducer.example.com:7777/google/. Again, check that you are challenged by SSO if you did not previously log in. When you register Pagelet Producer in WebCenter Spaces, use http://pageletproducer.example.com:7777/ and make sure that portlets render correctly. When you create a WebCenter crawl source, use http://webtier-spaces.example.com:7777/rsscrawl and http://webtier-spaces.example.com:7777/sesUserAuth for the crawl and authentication end points. Make sure that the crawl and search functions works correctly.